Celebrity chef Jamie Oliver makes his DS debut with 'What's Cooking? Jamie Oliver'. Will it satisfy our appetite for another quality cookbook on the Nintendo DS? Jamie Oliver is no stranger to bookshelves, videos and television. Now with 'What's Cooking? Jamie Oliver' the mockney chef makes his debut appearance on the worlds favourite handheld. Will Jamie's new interactive DS cookbook prove to be a rival to the excellent Cooking Guide, or is it merely a half-baked pretender? 'What's Cooking? Jamie Oliver' is actually two titles in one. There's the interactive cookbook and the cooking game. Starting with the interactive cookbook, there are 101 recipes to try in the repertoire. You can filter by ingredients, time required to cook or by vegetarian options. Searching is a little sluggish, especially considering the lightning quick loading times DS owners will be used to. Bizarrely, there's no way to search by keyword, or even save a recipe to a favourites list. Perhaps the best way to use the cookbook is to simply browse it with your stylus. Jamie announces each recipe as you browse them and comments on the ones that you view, which is either interesting or annoying depending on how you feel about the TV super-chef. Once you have chosen a recipe, you can browse the ingredients before starting, or even add them to an electronic shopping list. Whereas Cooking Guide took advantage of the electronic cookbook format by including videos, pictures, descriptions of ingredients and other useful information, 'What's Cooking? Jamie Oliver' simply presents each step as a short paragraph. Furthermore, just when you (might) want Jamie to start talking, he shuts up and there's no narration or verbal instruction whatsoever during the cooking. You can expect to read instructions like "whisk the mayonnaise, tomato ketchup and the Worcestershire sauce together". There are no additional instructions or helpful pictures to show novices what the resulting mixture should look like. Voice activation is available for turning the pages and is typically hit-and-miss. A tiny icon will light up red if the game miss-hears you. At least the recipes will be a little more appealing to a western audience than some of the exotic dishes Cooking Guide would have you serve up. So, the interactive cookbook is more than a little disappointing. Aside from being able to search the recipes more quickly on the DS, there doesn't seem to be any good reason to use your console in place of a regular cookery book. Perhaps the cooking game can save the day? The cooking game is presented as a kind of practise kitchen, where you can try your own hand at cooking whatever your imagination comes up with. We're sure our readers are smart enough to spot the flaws in this plan already. Until Nintendo come out with a taste and smell add on for the DS, this isn't likely to work. The fact that the graphics aren't exactly spectacular doesn't help either. Given free reign of the kitchen, we mixed prawns, banana, butter and lettuce and then fried them for an hour. Instead of having us scrape a gooey pile of virtual soot from a pan, Jamie Oliver was delighted "Cor yeah that's tasty!" he exclaimed. This is quite funny, until you remember that someone paid money for this game. There are also cookery challenges to complete, but playing the cooking game is neither fun nor educational. The games pretend cooking teaches you almost nothing about the real thing, or the quantities or techniques needed to prepare food. In fact, prodding virtual food around with your stylus is about as close to real cooking as playing Ridge Racer with your stylus is to driving. 'What's Cooking? Jamie Oliver' is far from "Pukka". The interactive cooking book is barely interactive at all, the cooking game is dull and pointless. You are far better off saving your money and buying a Jamie Oliver cookbook and a copy of Cooking Mama than this dead pan effort. Note – since 'What's Cooking? 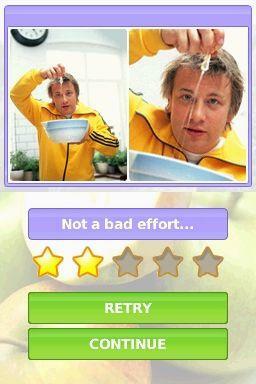 Jamie Oliver' is not a regular DS game, we have not given any adjusted scores. We're sure you can work out from the review if this title is of interest to you or not.